Be@Home is a home and activities blog which covers everything from interior design to arts and crafts activities. They try to have a little something for everybody, even occasional posts for gardening enthusiasts. Be@Home likes to feature blogs and bloggers who would interest our readers, and particularly likes to acknowledge bloggers who showcase their unique creations. 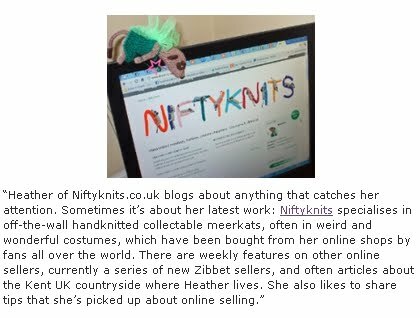 I was especially pleased with the photo as it showcases my favourite online venue, Zibbet! It was interesting to me in another way, as I've been pondering changing direction slightly with my blog. Being featured at this time is almost like when someone compliments you on how nice your hair looks...when it's driving you scatty and you're actually on your way to the hairdresser! What do you think? I'd love to hear your ideas of how you'd like to see my blog develop - after all, I don't only write it for myself! Whether you're one of Be@Home's 3,300 readers (wow!) or one of my regulars (smooch!) I'd be very interested in what you have to say!